We had just over two hours to stretch our legs whilst in transit at Hong Kong airport. As it was early morning many of the airside shops and cafes had not yet opened so we settled for McDonalds where we had some hot drinks and took an opportunity to catch up on the news on our iPads. Our Cathay Pacific flight to Manila was delayed by 25 minutes but this short delay was insignificant and didn’t really matter. Our gate was located about a 15 minute walk from the food court providing us with a little more exercise. The aircraft was an older style A330-300 with quite small seat back screens. The seating configuration was 2-4-2 and as we were by the window, we did not have a passenger next to us. All seats on the flight seemed to be taken, mostly by Filipino’s returning home. The in-flight entertainment was identical to that on our international flight but apart from the route map we didn’t make use of it as we were both tired after such a lengthy journey. 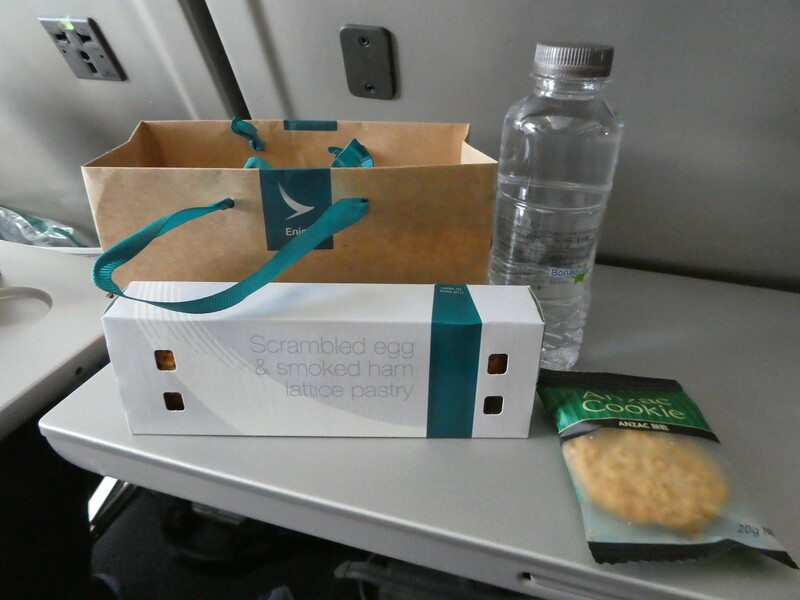 On-board snacks were distributed soon after take-off and consisted of a scrambled egg and smoked ham lattice pasty, an Anzac (coconut) biscuit and a bottle of water which was served in an attractive small brown bag. The snack was quite generous for the length of flight and after eating we both managed a short sleep before coming into land at Manila’s airport. Stepping off the plane there was only a short wait at immigration but it then seemed to take ages for our luggage to appear on the baggage carousel. Finally re-instated with our suitcases we obtained some Filipino Pesos in the arrivals hall and then went outdoors in search of the Grab taxi stand. Grab is the local equivalent of Uber and as public transport in Manila is practically non-existent it appeared to be the best way to get around. We had booked accommodation at the Sofitel and it only took a few minutes to arrange a taxi which cost 245 Peso (£3.50) for the 20 minute journey.. It was our first visit to the Philippines and we eagerly looked out of the taxi windows, getting our first impressions of Manila. 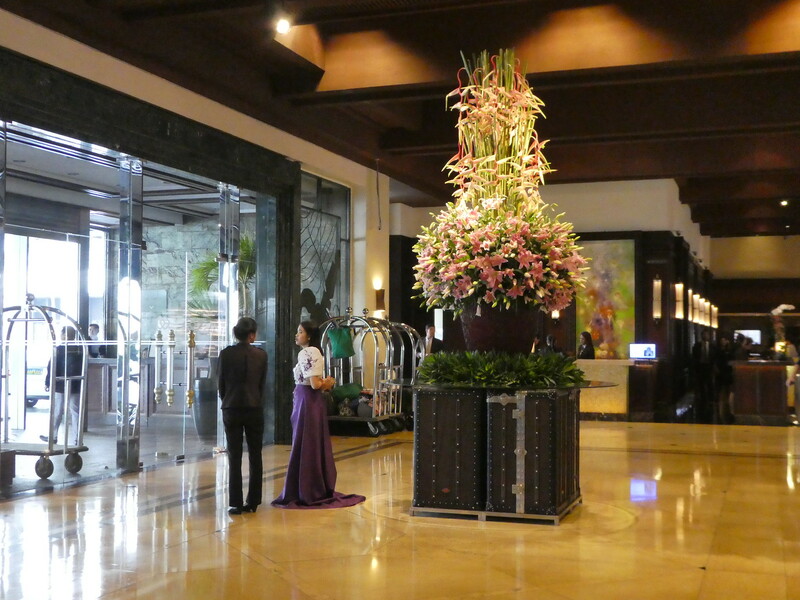 Arriving at the Sofitel Plaza, the concierge assisted us with our luggage and as we often stay at Accor hotels we were able to use the express check-in desk. Here we learnt that our room had been upgraded from superior to luxury which was exceedingly good news. A porter showed us to our spacious room on the 6th floor which was beautifully appointed with delightful views of the hotel’s pool and the sea. After quickly unpacking and making ourselves cups of tea, we freshened up and were soon ready to go out and start exploring. We took the lift down to the ground floor and followed a path along to the attractively landscaped pool area. It was a slightly overcast day but the temperature felt comfortable with a gentle sea breeze. 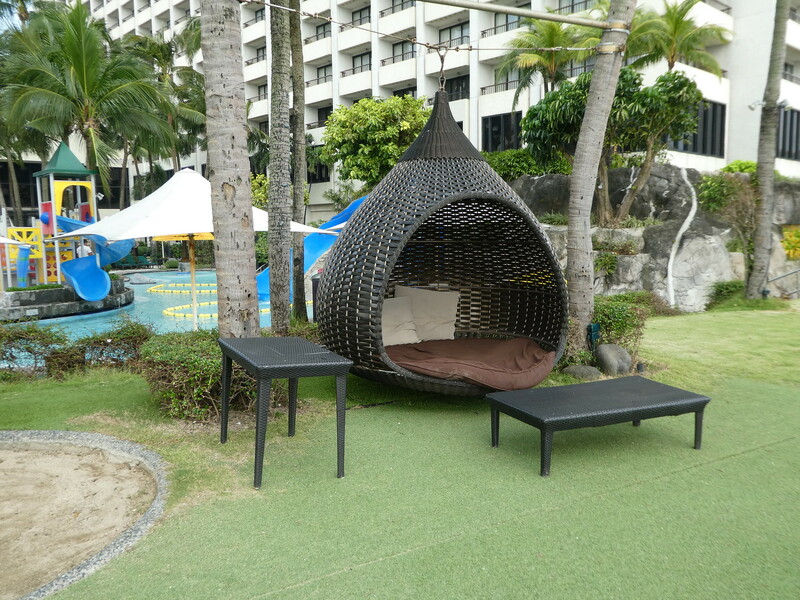 We flopped down on a comfortable wicker sun lounger but decided not to linger too long as otherwise we would have probably fallen asleep. The path led us to the seafront and after leaving the hotel’s grounds we continued along the bay walk where we found little evidence of the recent typhoon which had ravaged the country. It was very pleasant strolling along the palm tree lined seafront and viewing the small boats tied to their moorings. Soon we came to a cluster of restaurants and cafes and before returning to the hotel, we paused in one of them for cooling drinks which were extremely cheap by British standards. Back at the Sofitel we relaxed awhile on our extremely comfortable bed before deciding to go out for something to eat. We could see forks of lightning across the bay and although it wasn’t raining, we set off armed with a large brown Sofitel umbrella that had been left for our use in the wardrobe. We couldn’t have timed it better as large raindrops started to fall just as we were approaching the restaurants we’d passed earlier so we decided to go in the first one we came to. It proved to be a good choice as our shared pork noodle and vegetable dishes tasted delicious and were nice and light after our lengthy flights. 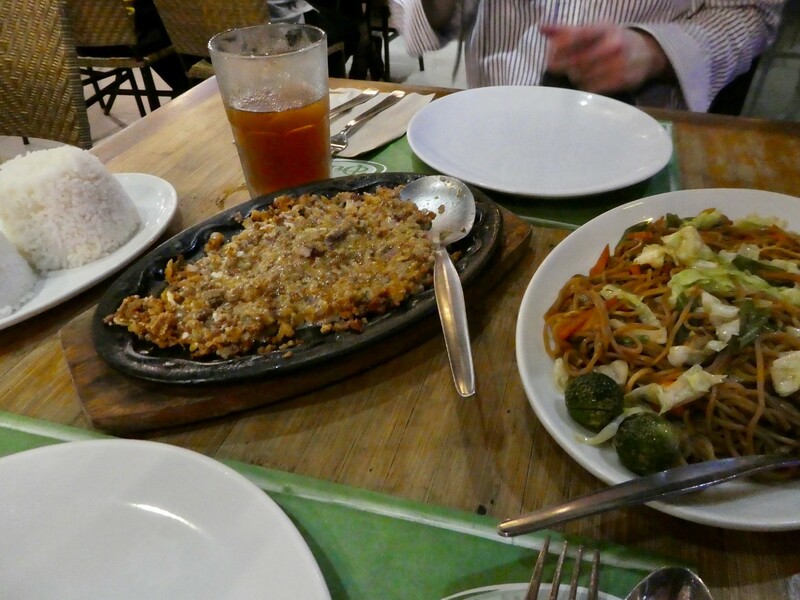 Unlike many Asian countries, Filipino’s always use cutlery rather than chopsticks when dining. Rain was beating on the windows but fortunately by the time we were ready to leave, the storm had all but passed and we kept dry huddled beneath our large umbrella. Before going to bed we enjoyed glasses of wine in one of the hotel bars. A pianist was playing a medley of tunes and it was so relaxing that we felt our eyes closing so we returned to our room to get a good night’s sleep. On opening the door we discovered that a tasty ginger cake had been delivered so we shared that with a cup of tea before climbing into our super comfortable bed and falling asleep in seconds. I really enjoyed your Manila Series. At times as residents we take everything for granted until you see things from other travelers perspective. Thanks for sharing. It’s my pleasure Lora. It’s the same for most people that we see things with different eyes when we are visitors rather than residents of a town or city. Sounds like lots of fun! And gorgeous palm trees, there! I didn’t realize. We had such a lot of fun in Manila with so many interesting things to see and do. I would definitely recommend a few days there before heading to the smaller islands with their idyllic beaches. Hi, Little Miss Traveler. It’s great to see your posts about Manila. This one jumped at me from among the blogs I’m following as it’s seldom that foreigners feature the capital. 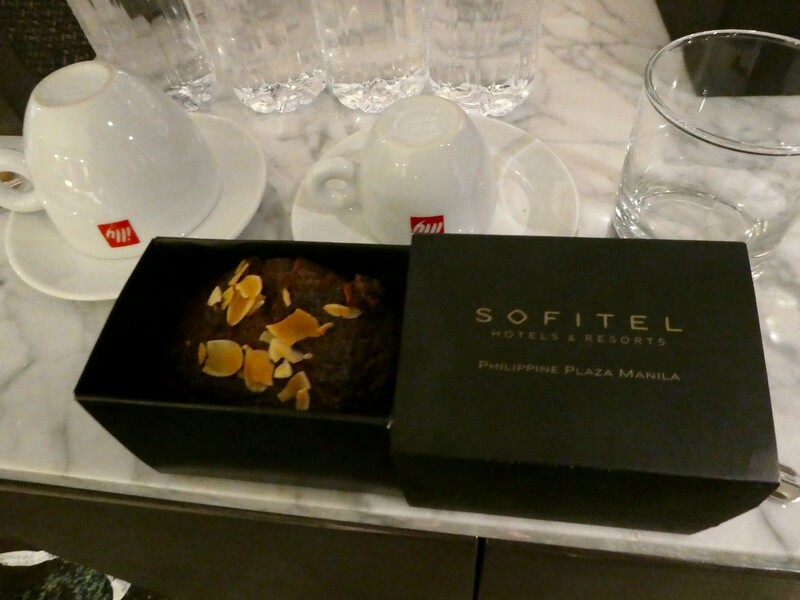 We also stayed at the Sofitel when we visited as a family in November 2014. We declared the Spiral buffet as the best spread we’ve ever had. Would love to see your future posts about the islands when you visit them. Thank you so much for your kind words about my Manila posts. It’s so nice to read you are enjoying them, hopefully we will return to the Philippines before too long and be able to visit the smaller islands next time. 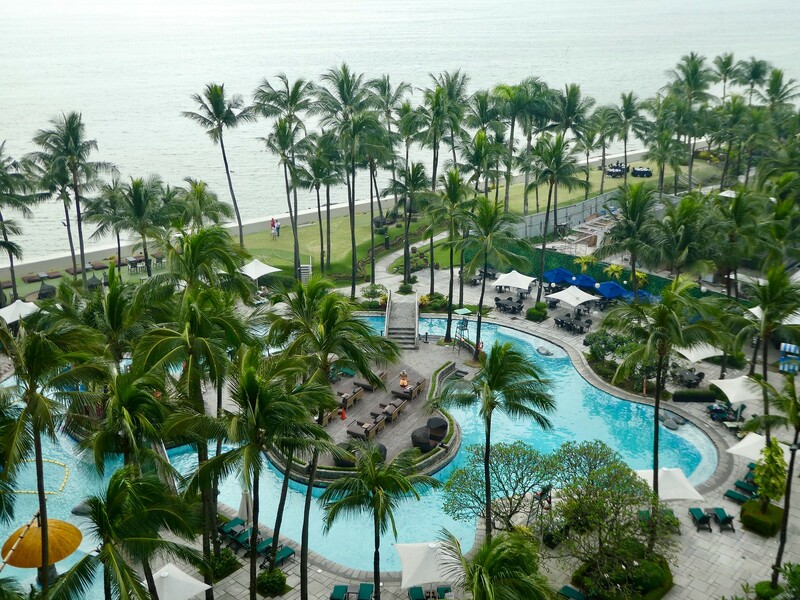 The Sofitel is a beautiful hotel and not so expensive as others by European standards. Gosh, it would have been amazing to have been at the hotel the same time as Coldplay – they are one of my favourite bands. Well there is much beauty in the Philippines and you certainly photographed some of the best views. You are in for a surprise when you tour some of the crowded settlements around the canals. That is an eye opener. I seem to remember it was best to go to the departures floor to get a taxi rather than just outside arrivals but maybe they’ve changed it so arrivals don’t get ripped off on their taxi ride into town. LOL. We lived for a while at a university in Caviti on the way up to a extinct volcano with the most breathtaking view. As I recall that is south of Manila. I don’t know if you are going to island hop to places like Cebu and Cagayan de Oro. Worth your while seeing those places though south of Cagayan can be unsafe with the insurgency. Be careful to take taxi services the hotel recommends. Thank you for your advice Ian. Unfortunately we didn’t get time to visit Caviti this time but I’d read the extinct volcano was breathtaking. Hopefully we can return sometime to take this trip and visit Cebu. Thank you, it was so wonderful to draw back the curtains and witness such an amazing view. Great post Marion. I recall a champagne brunch at the Sofitel Manila…well I recall the earlier part of the brunch. ha ha. That made me laugh Sue! 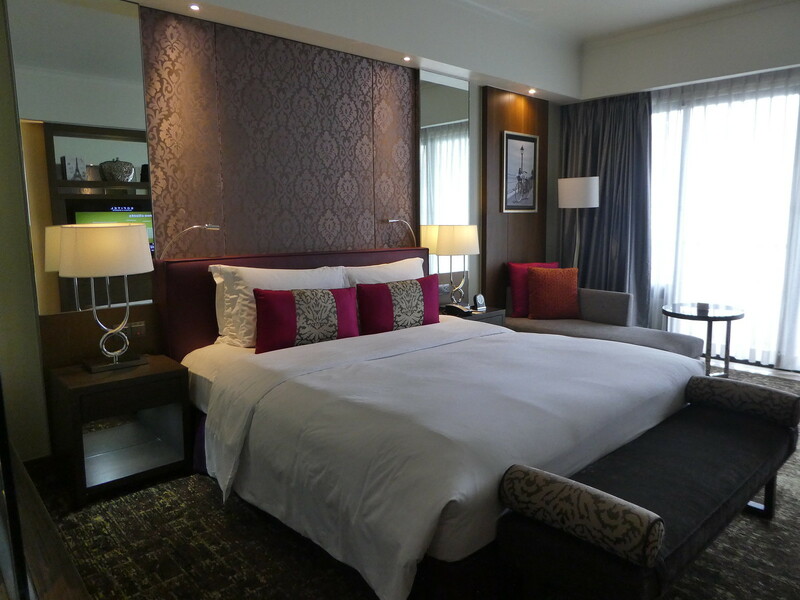 The Sofitel Manila was a perfect spot to base ourselves in the capital and we had a lovely time . I’m happy that you had a good time during your visit in the Philippines. Hope I can see you on your next visit. Thank you for your kind words. Yes, I do hope we are able to meet next time we visit the Philippines too! It was very nice to hear from your Manila trip! I hope you guys had fun during your stay in the Philippines. It’s nice that you guys stayed in a luxurious hotel and had very good experience with it. I would recommend going around Manila to experience the culture (most especially in Intramuros, where you can enjoy old Spanish culture back when the Philippines was under the Spanish colonization), and if you are into Asian experience, you can visit Binondo, which is basically where all Chinese-Filipinos are and would experience the blooming Chinatown. It is especially alive during the Chinese New Year which will be somewhere in February. Thank you J for taking such an interest in this post on Manila. We did indeed visit Intramuros and Binondo which we enjoyed and I will be documenting these places in upcoming posts. Hopefully we will have an opportunity to return to the Philippines again and visit some of the smaller islands and beautiful beaches. Looking forward to your posts on Manila. I will be there for a meeting in March. Enjoy your hols. One question please – do you blog on the go? Thanks. Thank you Edzan for taking an interest in my series of posts on Mainla, Inhope you find them useful and have time to visit some of the cultural attractions. I have actually returned home now – I make notes whilst away but prefer to concentrate on writing my detailed posts on return. So nice to read about your Manila experience. Thank you for your welcome thoughts Karen. I’m so pleased we decided to spend a few days in the capital. Thank you for your helpful tips Karen – I’ll remember that. I enjoyed this very much. We spent a year an hour north of Manila, forty some years ago. It sounds like transportation is much different. There used to be jeepney drivers always ready to transport people. Was the noodle dish called pancit? Have you tried calamansi juice? It’s delicious! Your accommodations look luxurious! Thanks for your posts. Hi Debbie, It’s so nice to hear from you and to read your welcome thoughts about your time spent near Manila. Yes, I do believe the noodle dish was called pancit and it tasted very good. Not come across calamansi juice though but sounds delicious. Very nice to hear what you thought of Manila. I didn’t get to see much of it on my trip as I was on a tour going all over the Philippines; upon arrival in Manila, we got a few hours’ sleep at a hotel before going back to the airport to fly to Bohol. Plus we went on a little cruise in the bay after we flew back at the end. Most of what I did see of Manila was in the dark – the most memorable thing was the jeepneys! We found lots of interesting things to see and do during our few days in Manila and enjoyed the city very much apart from the horrendous traffic. We saw dozens of jeepneys but preferred to travel round in a taxi or walk. I’d like to visit some of the smaller islands on a future trip to the Philippines. Thank you for taking an interest in my post, it’s much appreciated. You’re making me want to book a flight back! Thanks Jeanette, although I’d like to visit some of the smaller islands on a future visit to the Philippines, there is plenty to see and do in Manila and the people are all very polite and friendly. Thanks Joy for your ever welcome thoughts. Manila has horrendous traffic congestion but is perfectly safe and clean and the Filipino’s are so friendly and welcoming. Thank you so much for your kind words – you’ve made my day! It’s so gratifying to read that you enjoy my posts! I assumed that by the time you experienced those above, you have not yet seen the overall situation in Manila. It was great that you’ve stayed in a grand hotel that makes your stay a bit special. Because I just know a lot of people really skip Manila when they visit the Philippines. I hope you’d enjoy your stay here and explore more, especially the rural areas, where the beauty of nature is still really being preserved and well taken care of. Thank you Hanna for your kind words. 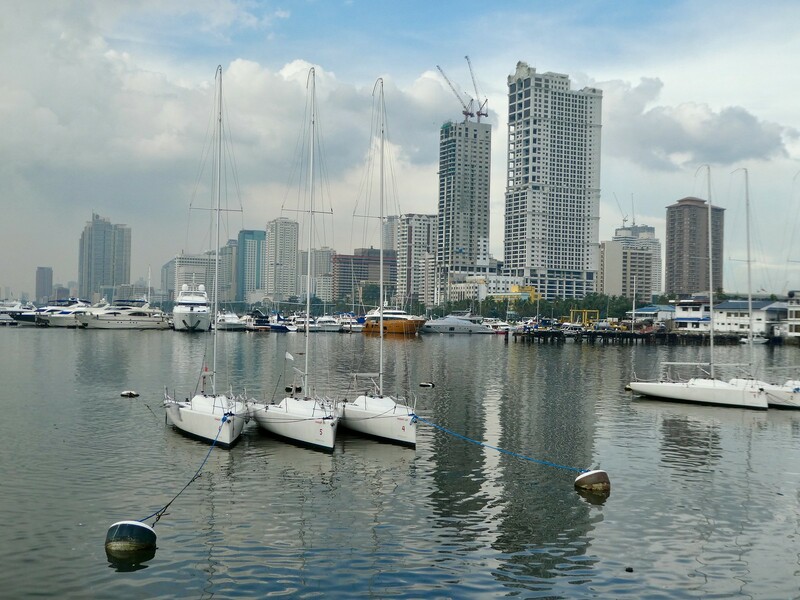 We enjoyed exploring Manila and would definitely like to return to the Philippines to visit some of the smaller islands and rural areas. Such a nice read. I was in Manila in 1996. Ages ago. Thanks for your welcome thoughts Timothy, it’s good to read that this post brought back some happy memories. I’m sure we will, thanks again. That and many other reasons. As a local, I don’t think anyone will ever fall in love at first sight with Manila. It’s not exactly your picture-perfect city. But once you get to know it, you’ll never forget it. Thank you for taking an interest in this post on Manila. Next time I visit the Phikippines I would love to stay in some of the smaller islands, they look idyllic. Thanks again for another interesting writeup of your travels. The Anzac is a traditional biscuit here in Australia main ingredients being rolled oats, sugar, coconut and golden syrup. 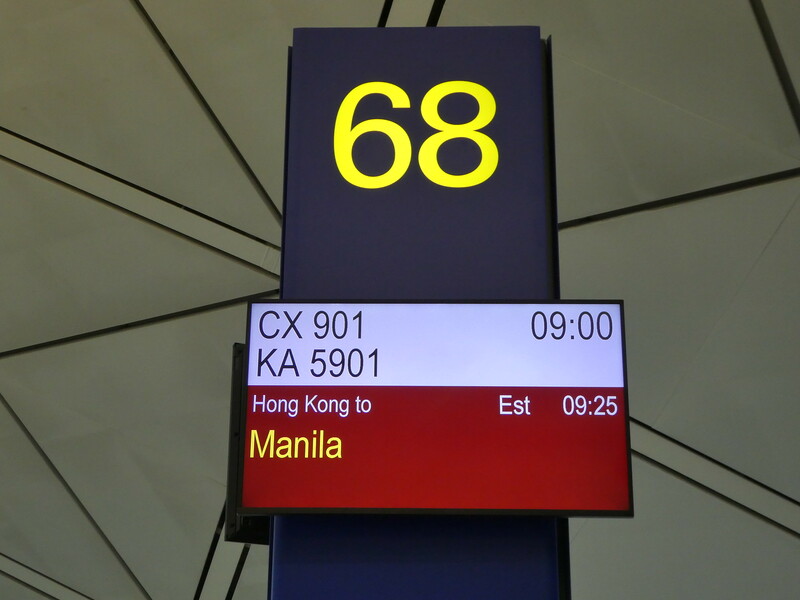 Interesting to see it on the Hong Kong to Manila flight. Thank you for your kind words, I’m pleased you enjoyed this post. Those Anzac biscuits were delicious !